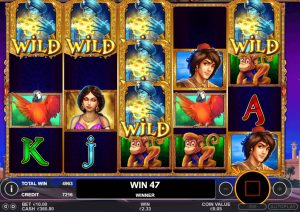 After Beowulf and Journey to the West today we take a look at another new Pragmatic Play slot. Interesting is the way the provider takes inspiration from old tales and stories when making their games. So after Norse and East Asian folklore, Pragmatic Play takes us in the Middle East with their new title. 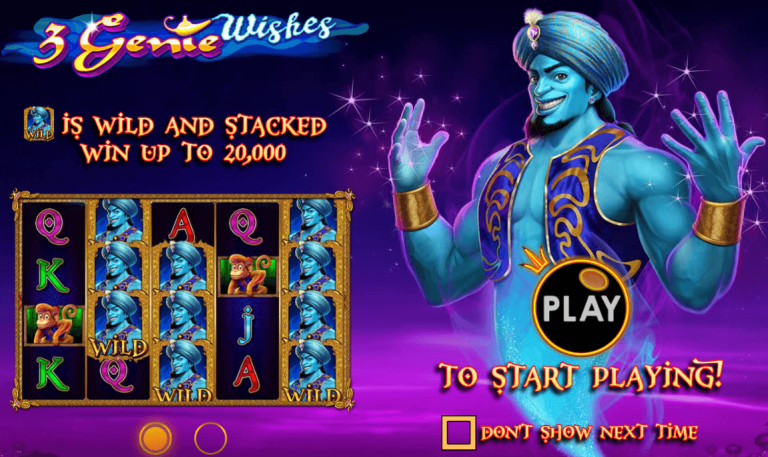 The new slot is called 3 Genie Wishes and at the moment is only available on LeoVegas as an exclusive release. 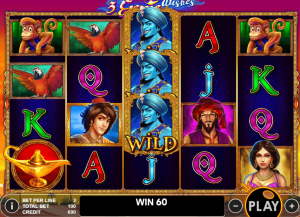 3 Genie Wishes is a 5 reels and 50 paylines slot available to play on desktop and most mobile devices. The game’s theme is based on the famous tale of Aladdin and the magic lamp. The game has an arabic feel with the background showing what probably is the mythical city of Agrabah. The high value symbols on the reels are all theme related and feature the main characters form the tale. Aladdin as the highest paying symbol and then Princess Jasmine, Jafar, Iago the parrot and Aladdin’s pet monkey. 10, J, Q, K and A make up the lower value symbols. The scatter symbol is the magic lamp and it can only land on reels 1, 3 and 5. The wild symbol features the Genie. The wild can appear stacked on the reels and it substitutes for all other symbols except the scatter. Small Award which gives a coin prize of 1x the total bet. High Award which gives a coin prize of between 10x - 500x the total bet. 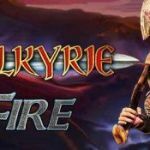 Free spins which grants a certain number of free spins with raining wilds or sticky wilds. If the item picked during the feature awards free spins, one of the following types is randomly chosen. 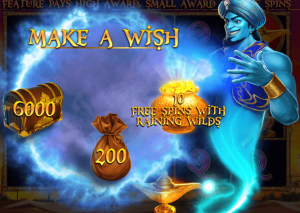 Raining Wilds - 10 free spins are awarded. During each spin a number of Wild symbols will be added in random positions on the reels. When one spin is concluded the wilds will be removed and other wilds will be randomly added on the next spin. 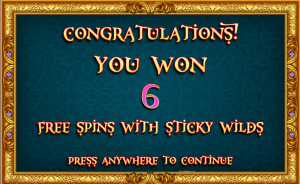 Sticky Wilds - 6 free spins are awarded. During every spin wild symbols are randomly added on the reels. The wilds will remain in place for the entire duration of the free spins. Should be noted that free spins reels do not contain wild or scatter symbols. Moreover the free spins can not be retriggered or additional free spins granted. 3 Genie Wishes is a medium volatility slot with an RTP of 96.53%. 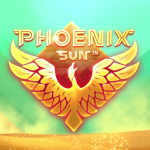 The highest possible wins are possible during the free spins or by getting the high award with goes up to 500x. Pragmatic Play has really impressed with their performance. Their games including 3 Genie Wishes have great themes, excellent design, graphics and smooth gameplay. In addition each game comes with unique features which make them fun to play.